Once breech-loading guns became the norm, the gun itself was only one part of the equation. Ammunition was the great variable, as demonstrated by the advertising display boards produced in large numbers for the gun shops and ironmongers of the United Kingdom. 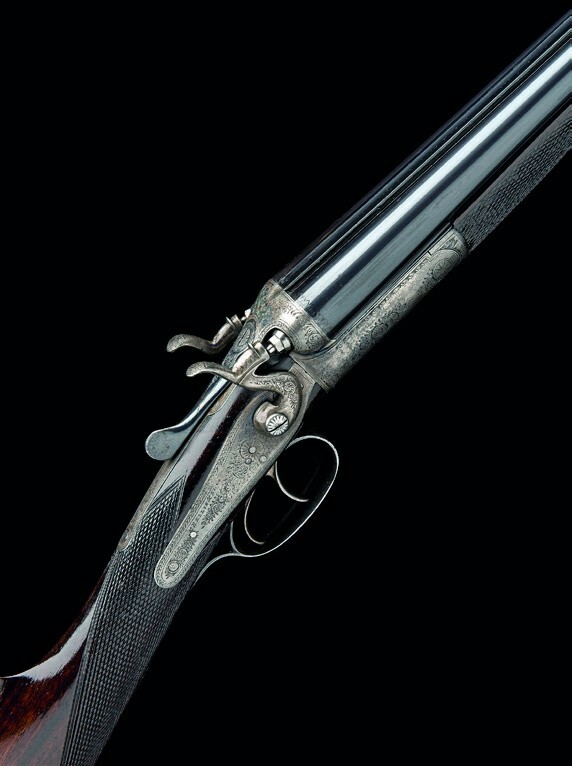 A fully-fledged .410 hammer game gun by Hellis – £1600 at Holts. Rather than print posters, cartridge makers took to creating wagon wheels of their products, framed behind glass, to entice customers. A good example of just such a display dating from c.1895 came up at Holts (% buyer’s premium) in Blackheath on December 13. Reproductions of these colourful displays are not uncommon, but original examples are in great demand among collectors and this one, in untouched condition, sold at £3800. It advertised Eley cartridges in gauges from .360 to 4-bore, including now unheard-of sizes like 32-bore, 24-bore and 14-bore. It promoted long-forgotten gunpowder types such as Curtis & Harvey, Walsrode, Cannonite, Hall’s, EB Nitro and others, and paper cases in a range of qualities. Any self-respecting cartridge collector aims to own at least one of these colourful boards. Interest in actually shooting historic sporting guns in unusual calibres continues to grow and one popular oddity in the Holts sale was a Charles Hellis doubled-barrelled top-lever hammer gun in diminutive .410 calibre. Weighing just 4½lbs, this little jewel had a respectably long 14½in (37cm) stock and sold for £1600. Holts has announced it is moving its auctions to a venue in central London with new preview and sale dates. Sales will be held at The Army Reserve Centre, Adam and Eve Mews, Kensington, London, W8 6TN. Holts used to hold auctions in Hammersmith, west London, and more recently in Blackheath in the south-east. The next auction will be held on Tuesday, March 19, at 10am.